Which Deck Material Should I use? 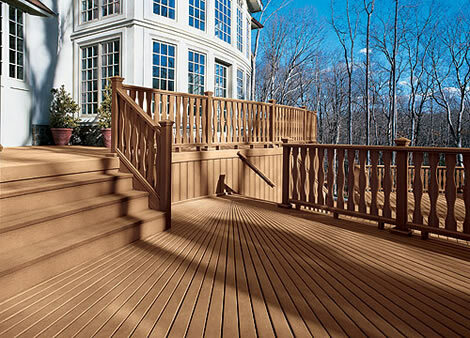 Decking Materials are available in different aesthetics, maintenance options, and price range. 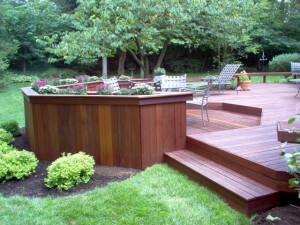 Our customers most often request cedar or composite decks, but there are other decks available. Here are 5 basic materials to choose from. 1. Pressure Treated Lumber This economically priced material is chemically treated pine and is easy to cut and fasten. The wood treatment resists rot, fungus and insects. The downside of this material is that it is not dimensionally stable and has the tendency to split and warp over time. 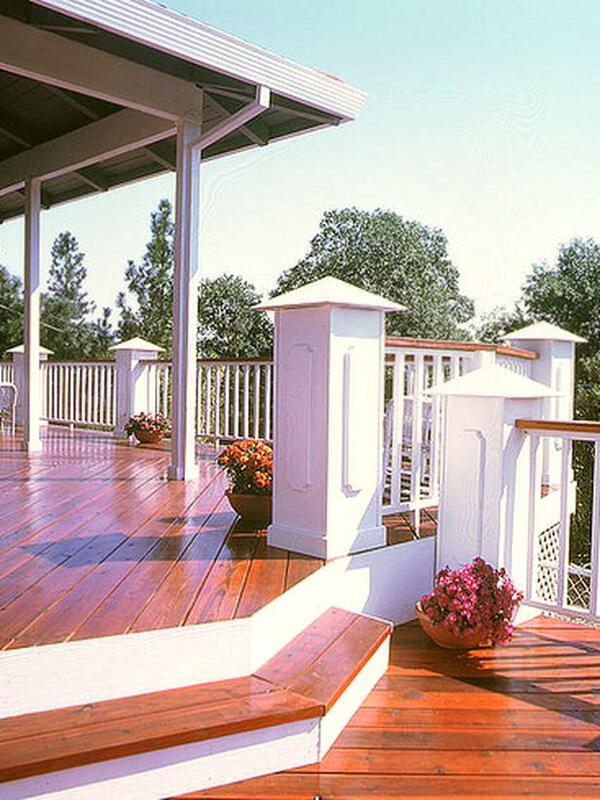 Wood preservative is often applied every 2-3 years to maintain this decking appearance. In recent years, the treatment chemical has changed from chromate copper arsenate to a less toxic material, such as copper quaternary or copper azole. 2. Cedar and Redwood These western softwoods don’t contain chemicals and have natural tannins and oils that resist rot and insects. These decking materials are rich in color and display their natural beauty. The wood center of these trees is more desirable, because it is more weather and insect resistant than the outer parts near the bark. The best grades for decking are: architect clear, custom clear, architect knotty and custom knotty. Recommendations for Redwood grades for decking are: Sapwood-streaked construction common or deck common redwoods. These natural materials require regular staining unless you like the weathered look. Every three to four years a clear water-repellent wood preservative can be applied to maintain the color. 3. 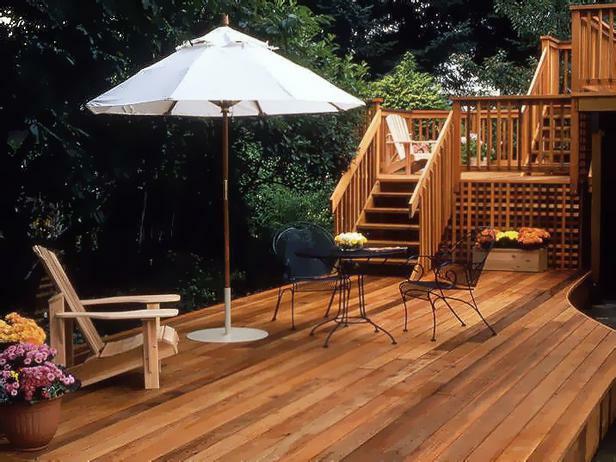 Tropical Hardwoods Exotic, rich grained woods like red tauari, tigerwood, ipe, Massaranduba, and Philippine mahogany are very hard, durable and naturally insect resistant. They are difficult to install because of the wood hardness and require boring of pilot holes. They may also require hidden fasteners that clip into the edge of the boards. These materials are expensive, but have beautiful rich colors. These woods may not take stains very well and will weather to a soft silver color. This material also needs to be preserved with UV-blocking clear wood preservatives every three to four years. 4. Plastics and Composites Most plastic decking is made from polyethylene or polyvinyl chlorine and is available in a wide assortment of colors. These materials are resistant to decay, cracking and have no knots for a consistent appearance. Composites, like Trex, contain recycled plastics and wood fibers. These materials are very weather resistant and the boards won’t rot or split. 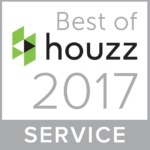 Prices vary because of the vast choices of these products, but composites tend to be less expensive than plastic decking materials. 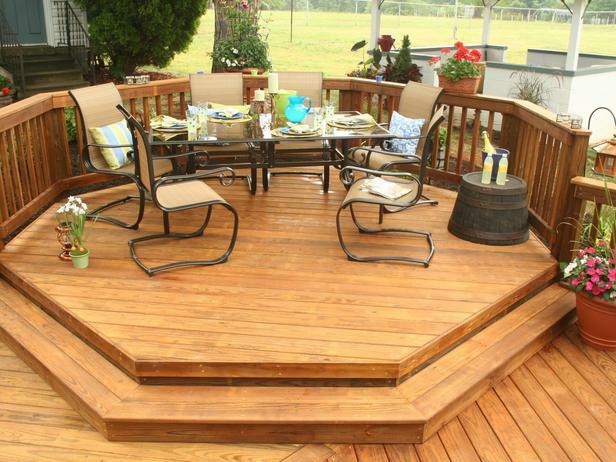 These types of decks require very little maintenance; however mold can grow in damp areas. composite decking material (customlandscapetyler.com) 5. 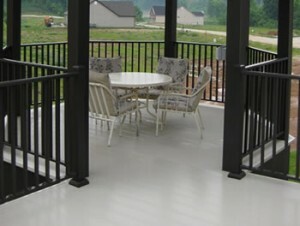 Aluminum The aluminum decking has a powder-coated finish and is extremely durable. It won’t decay, rust, warp, or splinter. In addition, this type of decking is slip and mold resistant and won’t catch fire. This light weight material has interlocking edges and contains built-in self-draining channels. The downside is that these channels could collect debris over time. Even in the hot sun aluminum dissipates heat efficiently and stays relatively cool. This decking material has ideal properties for a deck, but is also the most expensive of the decking materials available.